The Rijksmuseum has procured a painting by Gerard van Spaendonck, the most famous painter of floral still lifes of the second half of the 18th century. It was a long-cherished wish of the museum to include in its collection an important work by this Dutch painter of international renown. The Rijksmuseum’s director Taco Dibbits describes this painting as ‘a radiantly beautiful acquisition’. The purchase of Still Life of Flowers and Alabaster Vase from a gallery in Paris for €900,000 was made possible in part by participants in the BankGiro Lottery. The painting is on show from today. Gerard van Spaendonck (1746-1822) was born in the southern Dutch city of Tilburg and settled in Paris in the 1760s. He gained fame not only as a painter of floral still lifes, but also as the illustrator of the French king’s botanical collection, a highly prestigious position. He was a leading and active figure in the Parisian art world and a teacher of countless French and foreign artists. Gerard van Spaendonck did not make a great number of paintings, instead devoting much of his time to his watercolours of plants, and to his students. 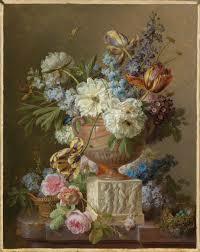 He is nonetheless considered to be his era’s best painter of flowers. On view in Gallery 1.11.